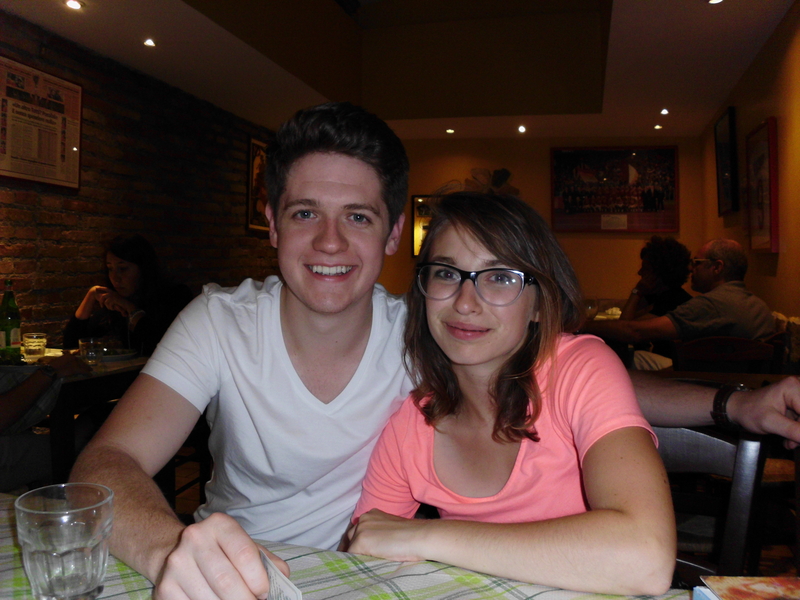 Reunion in Roma – "Aye…brilliant"
Our visitors were my daughter, Becky and her boyfriend, Michael and they were staying for 10 days. Thanks to the lack of affordability of travelling anywhere from Canada and the fact that they are university students, they would be flying from St. John’s, Newfoundland (Google it please – it is a lovely place) with multiple stops via Heathrow, Frankfurt and Rome (just an adventure for them). 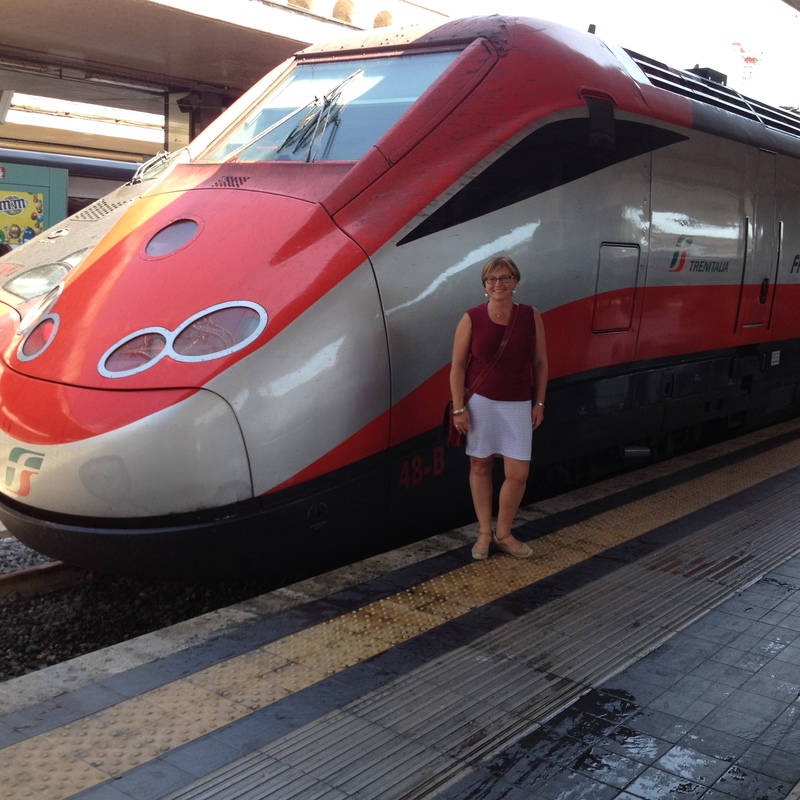 We decided to meet them in Rome, so we took advantage of the Trenitalia – Italian train system – via Maratea, Sapri, Naples to Rome. This was the way to see the Italian landscape – mountains looming on either side, with little villages cropping up in the oddest of locations. Churches on hill tops give way to buildings and houses cascading down the sides as if they had volcanically erupted from the hill itself. These lead into to gorgeous seascapes with sail boats and gentle waves in the most beautiful shades of blue imaginable. In and out of tunnels, the scenery constantly changed. Farmland and vineyards as far as you could see. Picturesque Italy- seen at 297 kilometers per hour. Still, it wasn’t all lovely. Train stations are known to run through poorer parts of towns and cities, so graffiti covers many a flat concrete surface. It’s hard to think of these spray painted surfaces as artistic. You pass through areas with buildings and homes that are indeed like tenements, junk and garbage piled, more graffiti, derelict buildings with broken glass. But amongst much of the harsher bits, there were little vegetable and flower patches – food and beauty in lush greens and bright colours. Apartment balconies held pots of brilliant flowers – even the laundry hung out to dry was colorful and invited one to admire it. 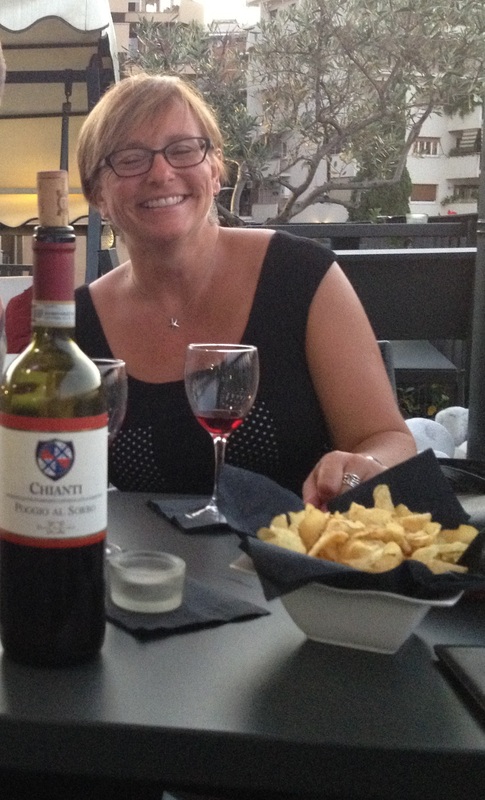 We arrived in Rome in the early afternoon – a few hours before Becky and Michael’s flight was to arrive. 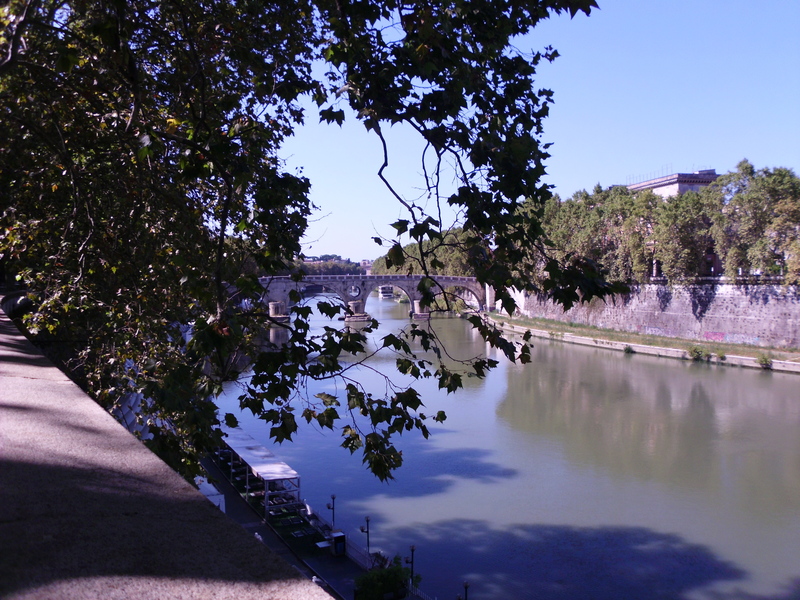 The Trilussa Palace Hotel was lovely and within walking distance of the Tiber River, so that’s where we headed. 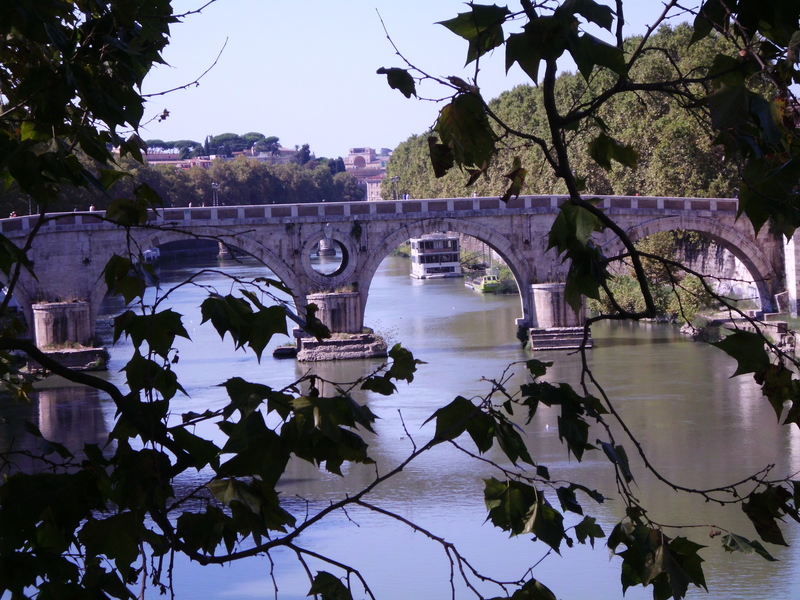 Then across the bridge to the more central part of Rome. Walking in and out of streets, jostling fellow tourists, inadvertently photo bombing bands of Japanese tourists, pressing our noses against shop windows saying “we should pop in there tomorrow” (we didn’t). We just wandered, not caring where we were going, because we had Google Maps on our phone! Rounding a corner, we found ourselves at the Piazza della Rotunda standing in front of our first real Roman monument, complete with an impressively large carved fountain, a massive building with huge columns and Latin words inscribed on the face of the building. And we did not have a clue where we were. Like two idiots we stood there and gaped at this work of obvious historic significance and thought ‘what the heck is this place?’ After a few minutes of contemplation and a mutual decision not to ask anyone for fear we would be labelled stupid, cretin or halfwit in any number of languages (there were tourists from everywhere), we decided to sit down at a fountain-side restaurant with free WiFi, order a ridiculously priced drink and just Google it! 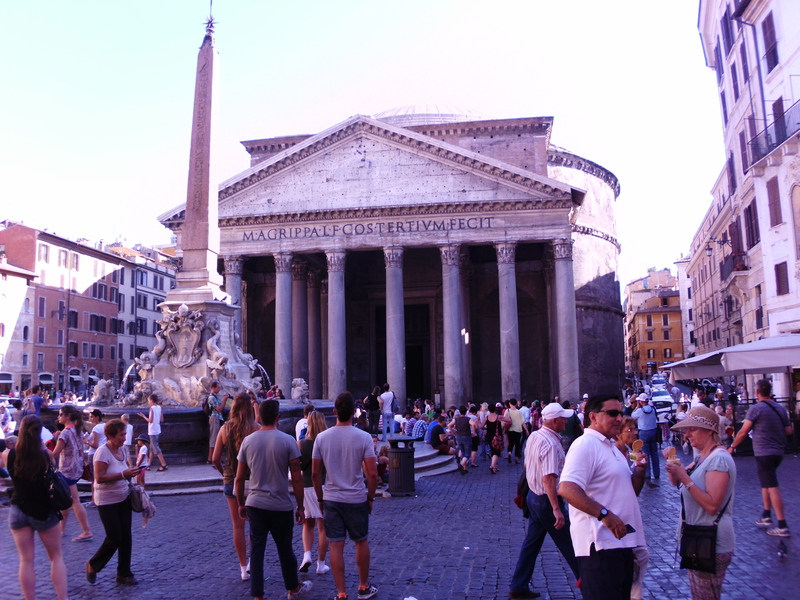 It turns out we were smack dab in front of the Pantheon, a building completed around 126 AD by the emperor Hadrian. Today it a church dedicated to St. Mary and the Martyrs (from the 7th century) and after nearly 2000 years holds the distinction of having the largest unreinforced concrete dome in the world – definitely built to last! We sipped our cold, overpriced drinks while we people watched and eavesdropped – a profusion of languages, map-wielding tourists in shorts and t-shirts, lone travellers, bored teenagers, sun-burned back packers, selfie-stick peddlers, fashionably dressed locals, black garbed priests, white shrouded nuns, buskers and Segway riders surrounded us and we were completely enthralled. Sounds melded into voices. Smells merged into sights. How could something be completely overwhelming and magnificently wonderful at the same time? Finally, a roaming accordion player passed around his hat, so we gladly threw in a few coins – he was incredibly good. We finished our drinks and with a quick check of Google Maps, we meandered our way back to the hotel. Red wine and snacks – no flames! Picture this – the barman opens and pours our wine (with flourish ). He leaves for a few minutes, only to return with chips in a bowl lined with a paper serviette. The barman moves to light a candle in the gathering twilight. To assist him, we adjust the position of the snack bowl. Voila! – We light the serviette on fire! Watching the flames circle the bowl, we ineffectively try to blow out the flames. The barman laughs, grabs the flaming bowl (with flouish) and within 30 seconds replaces it with another, much fuller bowl. He strategically places it away from the open flame this time. I waited. Checked my watch. Crossed and re-crossed my legs. Twisted my napkin. Tapped my fingers. Jumped every time the elevator sounded. And I sighed over and over, taking in and expelling deep breaths. Then I turned around and Becky and Michael were walking towards us. Not 5000 miles away or counting sleeps (known as ‘get ups’ by our wonderful friend Bert). Not packing a suitcase or waiting at Heathrow or en-route in a taxi. They were really and truly here in front of me. Becky lifted her hand in her signature little wave, her little five foot frame dwarfed by Michael’s 6’3″ self. Her smile was as broad as ever and her hair shorter than I’d seen it in years. And in a split second she was in my arms as I hugged her tight and cried. I hugged Michael too and kissed his travel stubbled cheek. You see, sometimes you don’t realize how much you’ve missed someone until they are right in front of you. And from the severe ache in my chest, I had missed her immensely. Immeasurably. Yet when I pulled back to look at her familiar, smiling face and heard her voice, it felt as if she’d been there with me all along. Posted on September 15, 2015 September 15, 2015 by jacquieharnettPosted in Family, Italy, Life stories, TravelTagged Family, Happiness, Italy, Rome, Travel.